Gain control over the sensitive information stored on your iPhone even in case of theft or loss. 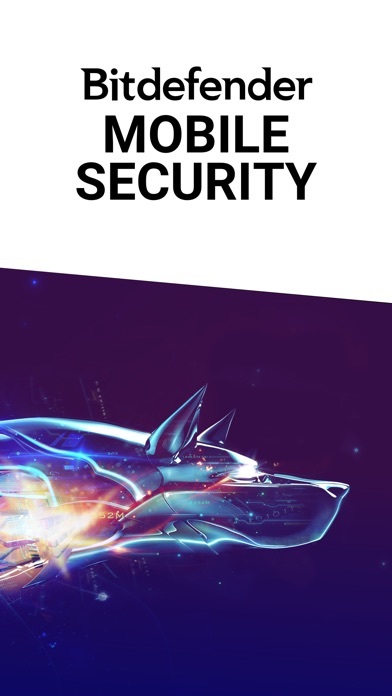 Keep your digital assets and online presence private at any time and under any circumstances with the newest app from worldwide security provider Bitdefender. Bitdefender Mobile Security is a free application designed to keep your sensitive data safe against prying eyes. Features at a glance VPN With Bitdefender VPN, you can stop worrying about privacy on the web. It protects your online presence by encrypting all Internet traffic. Bitdefender secures your device’s connection while you’re connected to public WiFi hotspots, cellular data networks and other public locations. Account Privacy Find out whether your email accounts have been leaked. Is your account still private? 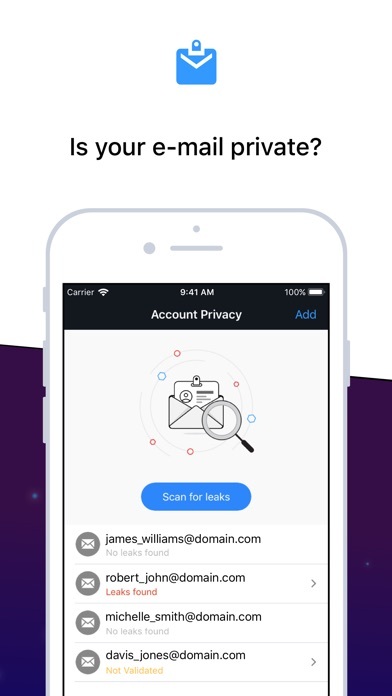 Simply validate your email address with the app and Bitdefender Mobile Security will run a check to discover if your privacy has been breached and let you know if it’s time to change passwords. 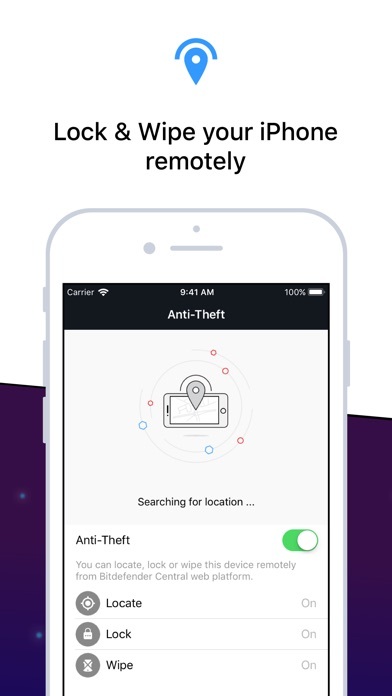 Anti-Theft The Anti-Theft module features its own Web dashboard that allows you to remotely locate, lock and wipe your iPhone. This way, you will make sure that whatever is stored on your device remains inaccessible to other people. Can’t find your iPhone? Lock it remotely to make sure nobody else takes a peek at your photos and private messages. Wipe your device remotely to permanently delete sensitive files and restore to factory settings. 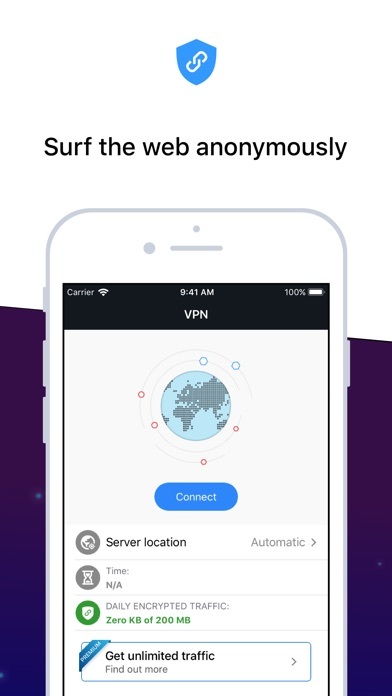 More about VPN Surf the web anonymously & unlock geo-IP restricted content with VPN. Free - 200 MB traffic / day. Upgrade to PREMIUM VPN and you get: -Unlimited traffic -Multiple virtual locations all over the world including US, UK, IT, AU! The payment will be charged to your iTunes Account at confirmation of purchase. The subscription renews automatically unless auto-renew is turned off at least 24-hours before the end of the current period. Subscriptions may be managed and auto-renewal may be turned off by going to your user’s Account Settings after purchase. Now with iPad support. Please Note! You need to have or create a Bitdefender account to use this free app. Consumer Reports highly recommended. I have tried for 3 years and going. They monitor all my devices 5 in all, my computer 2 iPhones and 2 iPads. So far so good especially with new threats affecting big banks and big companies like Equifax and others. The features other than lock did not work in previous version. Now the new update doesn't even work to lock IOS! Doesn't load device manager? Research and development team must not test products before release???? This app does not work correctly!! Bitdefender offers no antivirus protection for iPads or iPhones. This is a major gap in their cyber security coverage for their customers. The only option they offer is to purchase their network security device and spend additional money. Please work on the total solution that will work on all Apple devices for your customers, without having to purchase both bit defender for the iOS for Mac and then having to buy the network product as well. I attempted to use a 90-day trial of BitDefender Total Security. The downloaded version of BitDefender eliminated my previous installation of McAfee on my laptop computer and *then* told me that I couldn’t activate the BitDefender program (which left me with just the Windows Defender program to keep my laptop safe). When I then tried to use the Apple version of BitDefender on my iPad, the required terms and conditions had misspellings in it and stated the trial could be only 30 days, despite the 90-day trial period I was supposed to have been given. Furthermore, if one pays a subscription online for BitDefender, one is required to cancel it more than 30 days before the end of the subscription or risks being charged again! This is an unreasonable condition that I’ve never seen anywhere else. Since I wasn’t willing to consent to the terms and conditions, I could not try the BitDefender app on my iPad. One of the most difficult confusing apps ever installed. Sadly all that’s offered on iOS is a vpn, password breach notification and stolen device function. There is no scanning for malware here like there is on android and windows. Pickable VPN location requires extra funds. Find my phone is already covered by Apple. Do not see any reason to download.